I wanted to try a semi recumbent bike for kicking around. What I like about this style is I can touch the ground while sitting on the seat, because the pedals are forward relative to the seat, my knees won't come up to high while pedaling. It also looked like a comfy ride. The top image is something that looked pretty nice, it's a Day 6 Comfort Bike but it's $800 on the low end and then you get nickle and dimed for each thing added. My version is depicted in the lower image. It was cobbled together from an $80 used 7 speed Schwinn. I found someone to make an offset seat post (about 4" offset) on RatRodBikes.com for $8, and got some chopper handlebars from Amazon (about $12) to give the essential features of the Day 6. Regrettably, my seat isn't nearly as far back as the Day 6, but I do get a nice riding position. I'm not sure if I can get it further back. But, it's a fun bike for cheap. 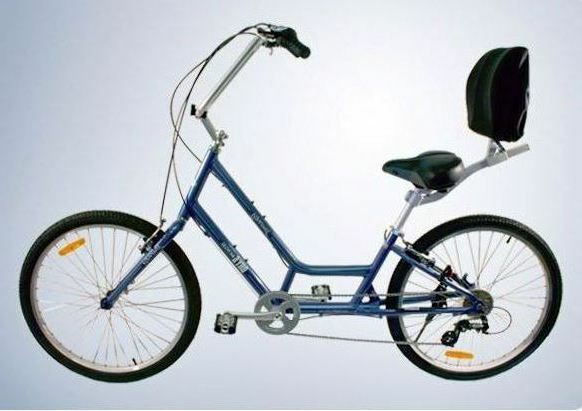 Why not make a recumbent bike/trike with windshield, use two regenerative motors (trike two rear motors), N810 uses Maemo Linux has GPS, WiFi, 7 hrs of use between charges and can be used for calculation of distance, speed, approx. power use, blogging (steal WiFi from libraries are these improvements? What is your battery sit-up again? Did you pedal the full distance? To get more info please visit http://researchpapergiant.com/.